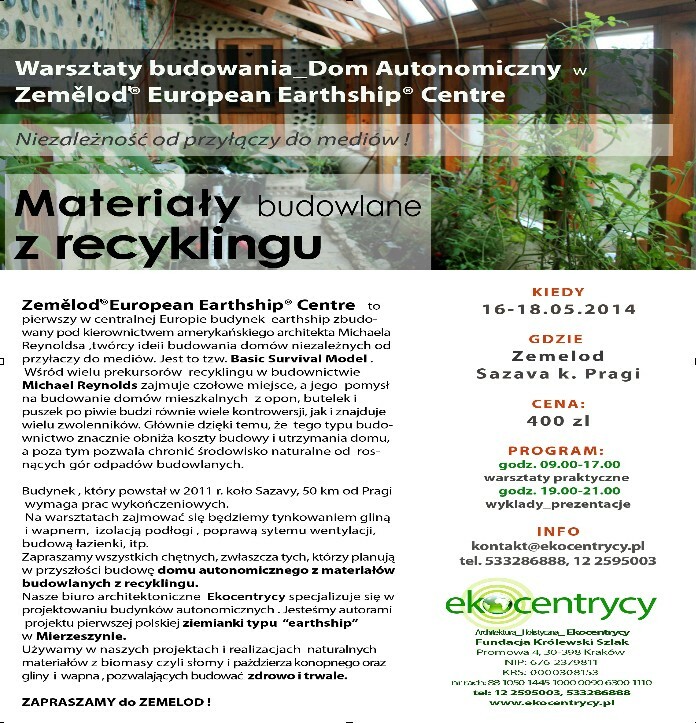 Mieszkańcy pierwszego europejskiego Basic Survival Model – Margerita i Martin poprosili nas o o ulepszenie modelu Michaela Reynoldsa zbudowanego koło Pragi w 2011 roku . Budynek jest wilgotny, z błędnie wykonaną wentylacją, za ciasny i przede wszystkim nieskończony . Na warsztatach będziemy budować fraktalną infrastrukturę dla odwiedzających, kończyć łazienkę , izolować podłogę, a przede wszystkim dobrze sie bawić :). Zapewniamy świetna atmosferę, dobre towarzystwo , mnóstwo koniecznych dla off-gridowców informacji , których nie zdobędziecie nigdzie indziej …. 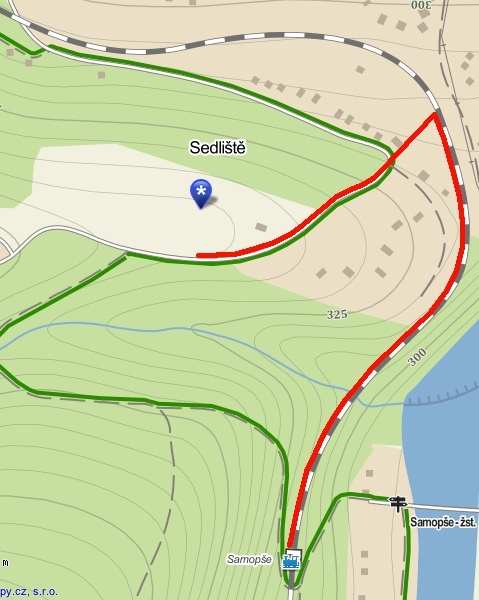 Go to the town of Sázava and (from the bridge) leave it southwards (see the map below – the red line) : Oldřichovo Quay, railway crossing, Lipová St., then turn right in the direction to Bělokozly. 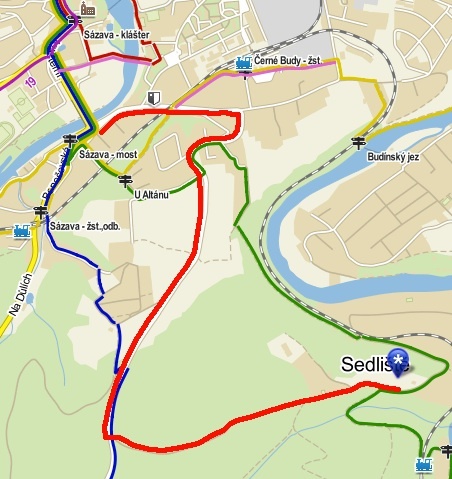 After leaving Sázava enter the woods and half way up turn left to Sedliště; it is the only left branch on the ascent, there is a triangle sign Crossing just in front of it, then little left turn and the branch is just behind it (it’s easy to miss it). There is an arrow Tábor Duha (and few others) on the tree by the branch. Beyond the branch go straight (descending little bit), then you should see few bungalows of Tábor Duha on your left hand side; Zeměnka is little bit further, on the left hand side too. You can park on the gravel in the entrance to the property; the entrance is to the left from the road, little bit beyond the small white cottage on your right hand side (the only building on the the right), just before the road starts to descend. Don’t stay on the road please (it is narrow and sometimes busy) and don’t drive further to the property. Note: there is no access from the river. Take bus 382 from Prague – Háje and go to the last stop (Sázava – Bus Station, just in front of the train station Sázava – Černé Budy). From there go little bit back, then turn left to Nádražní St., then turn right around U Malešáka Pub and immediately turn left upwards to Na Vápenkách St. and continue in the direction to Bělokozly. Then follow the instruction above. The road from the train station to Zeměnka is 3 km long and takes around 40 min. walk time. You can take a shortcut: take the green marked touristic line from the Na Vápenkách St. turning left to the K Rakovce Lane (first to the left) and follow the green line up to Zeměnka. Note: beyond the last house (on your right hand side) the green line turns sharply to the left and descends to the railroad and the river. This shortcut is 2 km long and takes around 30 min. walk time.